I have a large table, and I don't want it to exceed the page limit. Please see the code below. The table is much too wide for a normal portrait page. Therefore the following example rotates it via environment sidewaystable of package rotating. 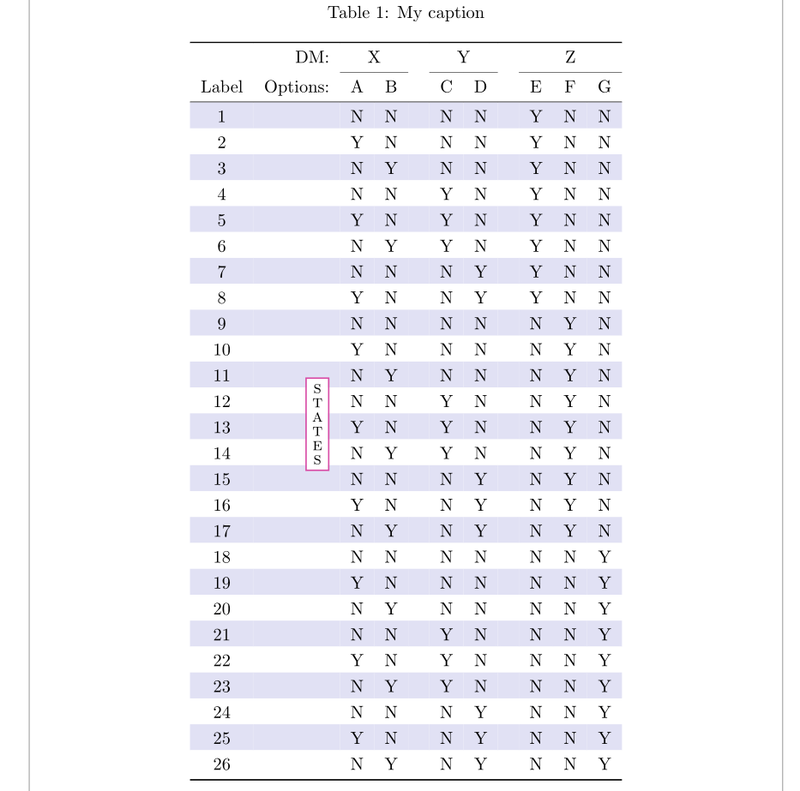 The width of the table is still too large, therefore it is decreased by reducing the space between columns via setting \tabcolsep to a smaller value. The background color is set by a simple \colorbox instead of coloring each column individually with the same color. \colorbox uses an additional margin, which is controlled by \fboxsep, which is set to zero here locally. The lines are set by the macros of package booktabs, which have a nicer spacing behavior. Package caption fixes the vertical spacing around table caption, which appear on top of the tabular. eliminate some redundancies in the column labelled "Option". Separately, I would also like to suggest that you use the line-drawing macros of the booktabs package (instead of \hline) and add a bit of whitespace between some of the rows. These changes will help a reader's eye glide over the copious material. Not the answer you're looking for? Browse other questions tagged tables width or ask your own question.